Jalandhar: His Eminence Tsugla Lopen of Central Monk Body in Bhutan, Venerable Samten Dorji visited Lovely Professional University today, where he interacted with hundreds of Bhutanese students at Shri Baldev Raj Mittal Auditorium of the University. Entering the central monk body at prime age of 8, the protagonist of Buddhist Philosophy, His Eminence Tsugla Lopen Samten Dorji has held many prestigious positions in Central Monastery of Bhutan. 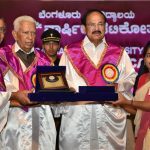 For his humane endeavours and contributions towards Buddhism, he has also been honoured with International Buddhist Peace Award by the US-based International University of Morality (Bangkok). Prior to this, he met LPU Chancellor Mr Ashok Mittal, Director Division of International Affairs Mr Aman Mittal and other senior officials of the University, had a campus tour, and appreciated the study- environ at LPU for holistic growth of the students. Seeing the loveliness in all aspects at the campus, the eminent guest attributed noun ‘Paradise’ to LPU for creating students’ strength. In accordance to his famous TV talk show with Bhutan Broadcasting Service ‘Nang Ghi Tam: The Inner Story’, H E Tsugla Lopen tried to listen to secrets, pain and pleasure of every individual student for suggesting them solutions and perfections. Taking the event as a Bhutan Festival, LPU Bhutanese students were in their country’s traditional & distinctive dresses, girls in ‘Kira’ and boys in ‘Gho’. Minister ranking member of the Council for Religious Affairs in Bhutan, H E Tsugla Lopen is in charge of activities pertaining to the study and contemplation of the scriptural traditions along with the five sciences. He was accompanied by three-member delegation from Bhutan including Education Attaché of Bhutan Embassy Mr Cheku Dorji. Other two delegates were Research Officer (Monastic Education Department) Lopen Namgay Wangchuk and Secretary of Monastic Education Khenpo Karma Lhuendup. Next articleThis Promise Day Keep Your Promises with Top 5 Personalized Presents!